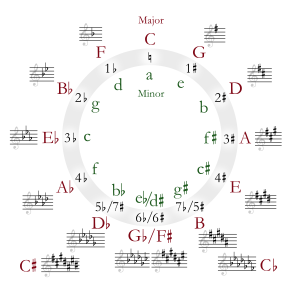 C minor is a minor scale based on C. The harmonic minor raises the B♭ to B♮. Its key signature has three flats. When written in jazz notation, its short form is Cm. Its relative major is E-flat major, and its parallel major is C major. In the Baroque period, music in C minor was usually written with a two-flat key signature. When this music is printed today, sometimes it is still printed in the same way. C minor has had the meaning of heroic struggle from Beethoven's time and the composer wrote many of his most emotional, dramatic works in this key. This has also been done by many others, following Beethoven's style. The table shows the number of sharps or flats in each scale. Minor scales are written in lower case. Wikimedia Commons has media related to C minor. This page was last changed on 29 December 2017, at 05:53.